If you're a real hardgainer, you're pushing your 1-rep max regularly. Here's how to hit a new high. A generic warmup and practice reps aren’t enough for a proper weight training workout. Just like sports athletes do specific prep work and drills in order to get ready for a game, you should follow a similar protocol in the gym. The key is to find the sweet spot between what’s needed to get your body prepared versus droning through 40 minutes of “prep” work, leaving you with 20 minutes to actually train. If you’re looking to build muscle and get as strong as possible in the process, that means you’ll have to test your one rep max (1RM) at the beginning or end of a solid phase of strength work. This makes what happens before you attempt to hit a new 1RM that much more important. Prepare to hit a new record 1RM with these three essentials. Some lifters will go into a workout and start things off with a long stretch. Though I believe there are plenty of benefits of static stretching, it’s not as effective as other methods when workout prep is the name of the game. Stiff muscles and tight joints need mobility work from dynamic movements like jogging, lunges, leg swings, and arm circles to really reap the following benefits. Mobility work elevates muscle temperature. Dynamic actions that involve mobility to the joints will make the muscles warmer and better prepared to resistance train. They help the joints release synovial fluid. This lubricates the joints and makes it easier to achieve full ROM without any blockage or pain. They don’t dull the nervous system. Since nothing dynamic is held for a long time, the nervous system doesn’t suffer. If you’re testing your 1RM for the bench, you don’t need to be skipping or doing jump squats to get ready. Different muscles have different clusters of motor units that activate them. We need to think about getting them ready to do hard work. Unloaded movement that simulates the action you’re about to perform is a good start. 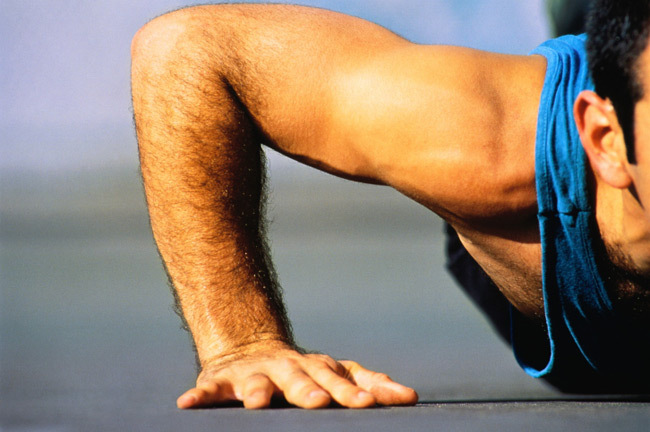 In the case of the bench press, start with plyo pushups (even where the hands are elevated if you’re not quite advanced enough to start from the floor). Also remember that fatigue is the enemy. You’re about to use all your stores of energy to hit a new 1RM, so make sure everything you do before then is strictly focused on power and explosiveness—not hitting your limit. When you can’t explode anymore, it means your fast twitch muscle fibers are beginning to drop out of the lift. That’s bad news for your workout, so keep these reps low. Now we’re at the part of the workout where we’re doing our ramping sets of the specific movement. The same rules apply as the above section. You don’t want to fatigue your muscles yet; you want to stimulate them. Therefore, the amount of reps you actually do with, for example, your 8-rep max, will be significantly lower than what you know you can actually do for 8 reps.
Granted, especially if you have a very high strength ceiling (someone who can bench press 365 lbs. versus someone who can bench press 195 lbs. ), it may take a few more reps or even sets at the lightest weight available to get warm. This may even feel like part of the mobility-style warmup at first, but when the weight starts to work its way up, remember to focus on good technique and a solid explosion. Next, don’t skimp on rest time. It takes longer for the nervous system to recover than a typically fatigued muscle. The above is my own personal method. You’ll find as a lifter that everything doesn’t always have to make perfect sense when it comes to the particulars of getting in your “groove” and feeling strong and ready. Notice the 20-lb. incremental loading except for when I hit 275. For some reason, I need to press 275 in my lift for everything to feel right—even if the stagger is only 10 lbs. up and I’m clearly going higher. It’s just one of those things. Particulars aside, this is the formula to success in a 1RM attempt. Take your time, use these cues, and enjoy a new PR this week.